Today’s object is the maxillae of a dog from the Winslow site, an American Indian village in Maryland, that was scanned at the Virginia Museum of Natural History on July 17, 2014. Today’s object is the right mandible of a dog from the Winslow site, an American Indian village in Maryland, that was scanned at the Virginia Museum of Natural History on July 17, 2014. Today’s object is the ulna of a dog from the Winslow site, an American Indian village in Maryland, that was scanned at the Virginia Museum of Natural History on July 17, 2014. Today’s animation is a clip from a German Luger that was confiscated from the commander of a surrendering Nazi unit by General William Collier. 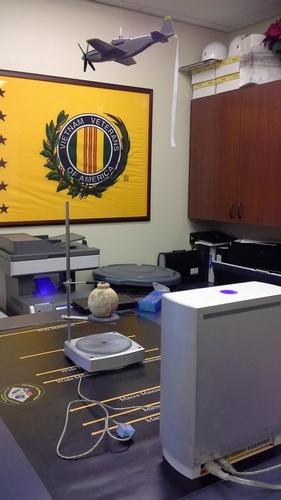 It was provided for scanning by his great granddaughter, VCU student Carson Collier. In addition to fighting in World War II, General Collier also served in World War I and the Korean War. The digital model was created by VCL Digital Curation Supervisor Lauren Volkers. The German Luger’s animation can be found here. 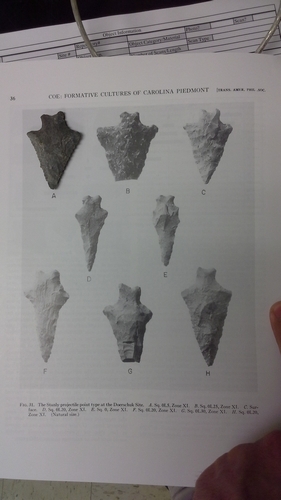 Today’s animation is another Stanly Stemmed point from the Doerschuck Site, North Carolina. 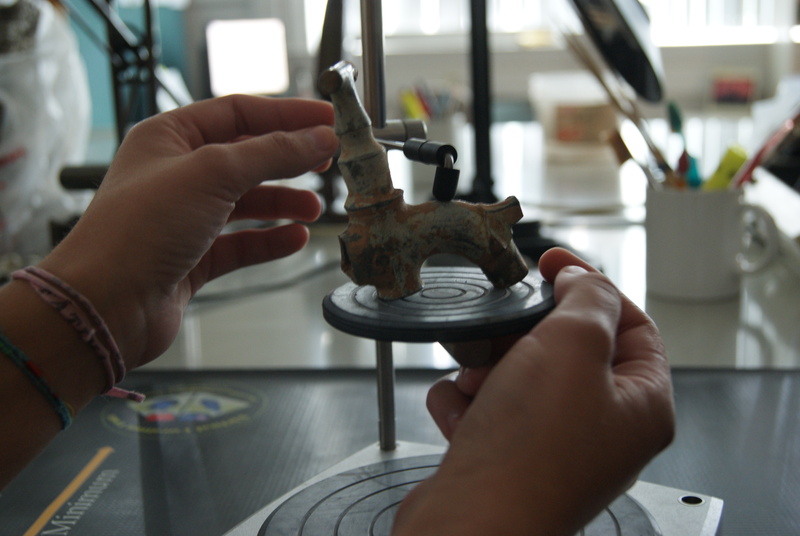 This point was scanned on August 4, 2014 in the Research Laboratories of Archaeology at the University of North Carolina-Chapel Hill. The point is illustrated in Figure 31 on Page 36 of Coe’s 1964 work “Formative Cultures of the Carolina Piedmont,” Transactions of the American Philosophical Society, Volume 54, Part 5. It is point A on that figure. Today’s first animation was scanned with a Sense 3D scanner and as of this date officially meets the National Register of Historic Places half-century criterion for consideration of historic significance. 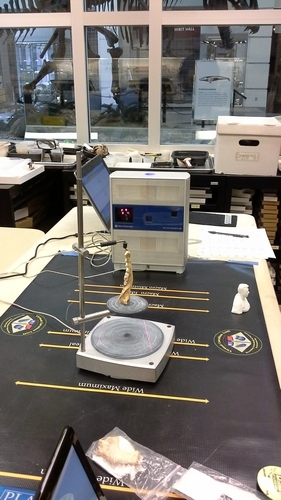 The second animation was created at the University of Mary Washington by Tim Owens, an Instructional Technology Specialist using a Printrbot Selfie. Today’s animation is a German Luger that was confiscated from the commander of a surrendering Nazi unit by General William Collier. 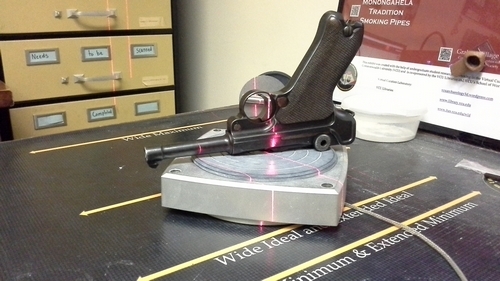 It was provided for scanning by his great granddaughter, VCU student Carson Collier. In addition to fighting in World War II, General Collier also served in World War I and the Korean War. The digital model was created by VCL Digital Curation Supervisor Lauren Volkers. 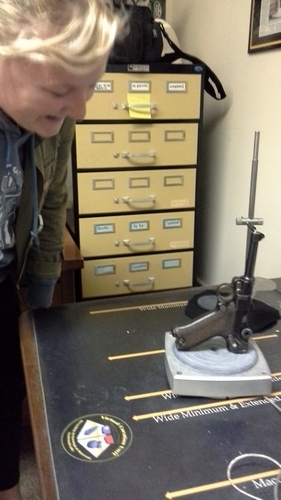 Carson Collier observes the scanning of the inactive German Luger. Today’s animation is a fragment of barbed wire from Utah Beach, one of the code names for a section of the Normandy coast of France, invaded as part of D-Day, June 6, 1944. It is a fragment of the German defenses and was scanned at the Virginia War Memorial on October 20, 2014. This fragment was donated to the Virginia War Memorial by Brian Alexander, a police officer. 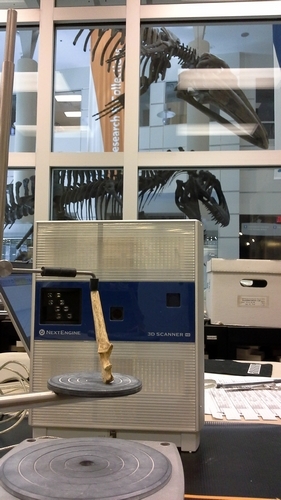 A small portion of the barbed wire was not captured by the 3D scanner, which is why there is a free-floating section. Digital Curation Specialist Lauren Volkers created this animation from her digital model on October 21, 2014. 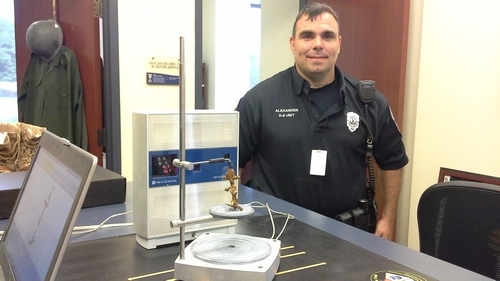 Police officer Brian Alexander watches as the barded wire he donated to the Virginia War Memorial is 3D scanned.